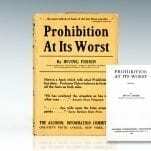 New York: Alcohol Information Committee, 1927. Early printing. Octavo, original cloth. Near fine in a near fine dust jacket. Rare in the original dust jacket. 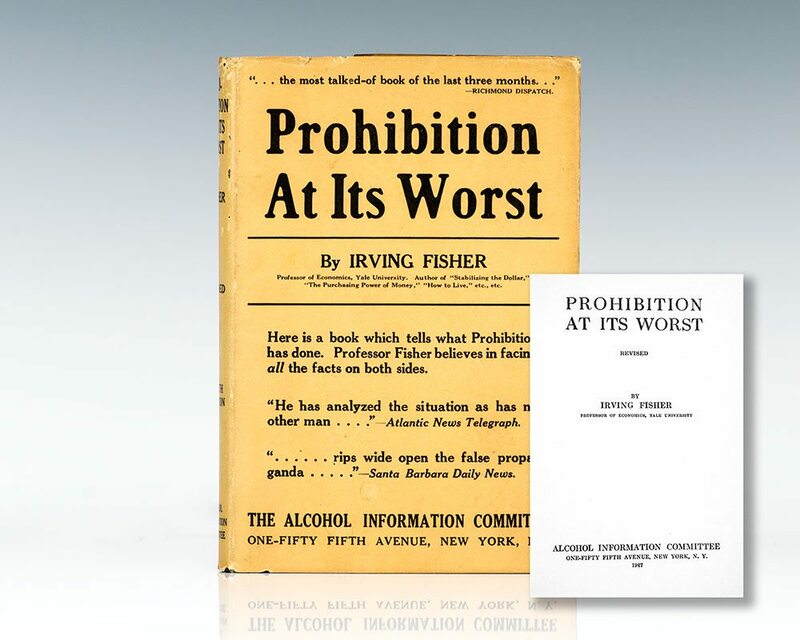 Mr. Fisher says he didn't want to be convinced that prohibition offered the solution of the drink problem, but the facts have forced him into that position" (Columbus Dispatch). "It is perhaps, the best dry tract to put in the hands of intelligent people, for Dr. Fisher at least speaks the language of the scientist and the scholar, and still he is never dull" (The New York Times). Booms and Depressions: Some First Principles. New York: Adelphi Publishers, 1932. First edition of Fisher’s classic work connecting monetary fluctuations to extreme periods of the business cycle. Octavo, original green cloth. Fine in the rare original dust jacket with some wear to the spine and a few small tears. 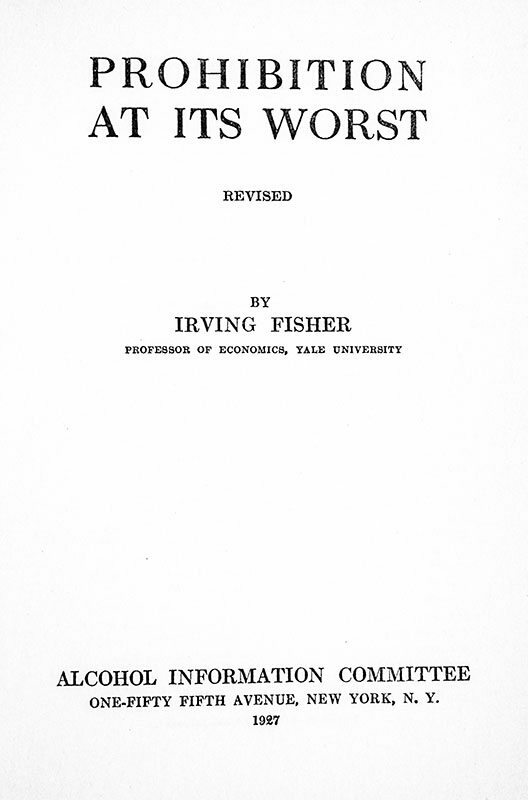 First edition of Fisher’s classic work connecting monetary fluctuations to extreme periods of the business cycle. Octavo, original green cloth. Presentation copy, inscribed and dated by the author on the front free endpaper, “To Mr. William Randolph Hearst with the compliments of Irving Fisher.” The recipient, William Randolph Hearst was an American newspaper magnate who built the nation’s largest newspaper chain and whose methods profoundly influenced American journalism during The Great Depression and beyond. He later expanded to magazines, creating the largest newspaper and magazine business in the world. In near fine condition, lacking the rare dust jacket. First edition of Fisher’s classic work connecting monetary fluctuations to extreme periods of the business cycle. Octavo, original green cloth. Inscribed and dated by Irving Fisher on the front free endpaper. In near fine condition with light toning to the extremities. Housed in a custom half morocco clamshell box. Uncommon signed and inscribed. Theory of Interest: As Determined by Impatience to Spend Income and Opportunity to Invest In It. New York: The MacMillan Company, 1930. 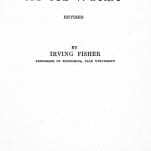 First edition of Irving Fisher’s groundbreaking work. Octavo, original blue cloth, fourteen tables in the text, seventeen tables in appendices fifty-eight charts in text, including three fold-out. Near fine in the rare original dust jacket with light wear. With the printed errata slip tipped-in at page vii. First edition. Octavo, original green cloth. Inscribed by the author on the front free endpaper, “To Prof. Frederick W. Rowan with the compliments and esteem of Irving Fisher.” In fine condition.